* Though a small state, MD does have various regions including mountains in the western part of the state, flat farm land in the southern and eastern regions as well as a beach on the eastern shore. Due to these differences the climate will vary but in the geographic center, Prince George’s County, the summers are hot and humid and the winters can get into the 20s at night, sometimes lower and sometimes with snow and/or occasional blizzards. * Maryland was nicknamed the Free State as a place where Catholics could leave New England and openly practice their religion. * It is historically considered a Southern state whose cash crop was tobacco. The state was a plantation economy largely reliant on the labor of enslaved people and indentured servants. Harriet Tubman, from Dorcester County, MD guided many slaves to freedom via the Underground Railroad network. *During the Civil War, a major reason Maryland did not secede was based upon President Lincoln declaring martial law on the state in 1861. With Virginia already part of the Confederacy, Lincoln could not risk having the capital of the Union surrounded completely by Confederate states. That being said, there were many Union supporters in the state and MD was considered part of the Union in the War Between the States. Currently, the state is comprised of people from various areas who have come to call Maryland home. In fact, my brothers and I are the first Maryland-born members of our family. In the face of the economic crisis, the Washington, D.C. area was deemed one of the most recession proof in the nation. Montgomery County, just outside of D.C., includes cities such as Rockville, Bethesda and Silver Spring, all of which have a high concentration of newer residents. This part of the state is also considered politically a more liberal region and may relate to the many government workers who arrived from the North, typically associated with more ‘blue’ states. Maryland itself is considered a blue state. There are also high Democrat populations in Prince George’s County and Baltimore City. If you go to the more rural areas of Southern MD and the Eastern Shore, where it is more likely that people have been there for generations, there is more of a Republican leaning. But can politics alone define if Maryland is Northern or Southern? Maybe other, lighter issues need to be considered. Many restaurants do not offer sweet tea, and the response ‘We have sugar on the table’ to put in cold tea just won’t cut it. 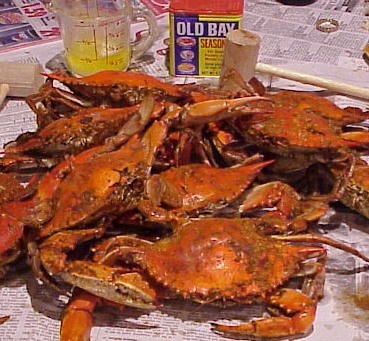 However, many foods considered traditionally Southern are also part of the culinary offerings of Maryland. Fried chicken, corn bread, greens, veggies fresh from the garden, and seafood seasoned with Old Bay (the seasoning which was invented in Maryland) are all common at many tables throughout the state. Because the regions in Maryland are so different, it is hard to speak for all of the state, but having grown up in the Southern MD/DC Metro area and living briefly on the Eastern Shore and Baltimore, I can relate my experiences best to these places. Many consider there to be an overall rude attitude in the city areas but I can say in SoMD and small towns on the Eastern Shore there is a more hospitable and laid back vibe among most of the people I have encountered. Plenty of people from P.G. County and all points south say “y’all” and much of the vernacular architecture (i.e. tobacco barns) reflects a more Southern style. One is just as likely to see Rebel Flags displayed in Southern MD as they are anywhere in the Deep South. Not condoning this practice, just noting as an observation. The D.C. area definitely does have a more Northern vibe though. So for me to answer this question I think it is that Maryland has influences from both. Sprawl from D.C. to the suburbs is making Maryland as a whole seem more of a Northern state as an increasing number of people relocate here for jobs, but in the areas unscathed by the sprawl, we can also get a glimpse of the rural and the Southern roots of this state. No place is perfect, but maybe Maryland as a whole has just the right balance of both. At this point you may be thinking, “why does this even matter?” and maybe many do not think on this as much as I have but with my background in historical research and reading about times when MD was considered part of the South, it got me thinking. And talking amongst friends brings so many differing opinions based on what part of the state they hail from. Never having lived north of the Mason-Dixon Line, I don’t have a lot of cultural reference points to go by, so I am just going on what I myself have lived. This isn’t meant to glorify or talk bad about either side, but being on the border of two regions, it’s inevitable that there will be influences of both. The local characteristics that create a sense of place make people feel comfortable calling a place home, and at the end of the day that’s all that really matters. I want to hear from you, especially Marylanders about what you think and why so go to the comments section and share your thoughts! I consider myself a northerner as I’m a first generation Marylander who’s family is from New York. The southern culture in Maryland is not something I relate to much, except for the food! MD crabs trump all others anywhere, any day! I agree with Peter, I’m born and bred Eastern Shore Celt (Scottish and Irish), and I LOVE SOUTHERN FOOD. But, at the end of the day, I have no regional dialect, all my eye teeth, hate Confederate Flags, and love Black people. I don’t HATE the South per se, but I do not identify as a Southerner. But those are all sweeping generalizations of the South. Plenty of Southern regions don’t have an accent either. I know tons of people from Savannah who talk just like I do. There are plenty of regional dialects all over the U.S. and plenty of toothless folk in rural Northern states. And some of the most influential American music originated in the South. Impeccable manners and kindness are traits I have always associated with being Southern. And I have always identified more with that part of my MD heritage, I don’t know why, it’s just a feeling. Maybe that’s why I have gravitated towards the Deep South. Also Savannah has the Scottish Games every year which are pretty badass if you ever have the chance to check it out! I do have a lot to say on the matter, but I’ll speak briefly on being a PG boy who ended up moving to the south. I miss very few things. I don’t have easy access to Korean food or a lot of good bands coming through constantly. I don’t miss the traffic, the constant hustle to get by, the expensiveness, the dirtiness at times, the lack of community. I associate those with Prince George’s and Baltimore (lived in both, born DC), as well as the rest of the northeast. I don’t know the western and eastern rural parts of the state well, but I always associated them with the south. When I began telling my friends that I was moving to Saint Augustine, FL most of them thought I was crazy. I think there is a mentality in the northeast that you’re at the center of things, which is certainly true in many ways. But what I have found awesome about the south is ease of life. Good people, smaller places, much more sense of community, actually getting to know your neighbors. My daily life has become much more pleasant, perhaps at the sake of certain excitements, but I still have a great time. I’m not really sure what I consider myself in terms of the north/south thing. Growing up PG, more often than not, is growing up in a very northeast style, but I doubt I’ll live in the northeast again. Too hardscrabble, too concerned about the material. I’m not sure I’ll continue living in the south though. I do have a love for the south I never thought I would have. One thing I have found interesting is that despite having moved so far, I literally live 2 blocks from Route 1 (they call it US 1 here) and a couple miles from 95. When you’ve lived that close to those roads all your life and you’ve been all over the country, you realize how similar this eastern seaboard is in so many ways. I consider myself to be more southern rather than northern. I tend to have a slight southern accent and I love the deep southern way of living. You are right, the Scottish Games in Savannah are just awesome. I hate the internet because it removes the ability to convey irony. But, I do like how the only things you could say about what I said was the dialect and the teeth. Being from the Eastern Shore, I’ve met some EXTREME racists who seemed perfectly normal otherwise. And they identify as Southern through and through. Not that all Southerners are racists, but I’ve noticed more racism in the South than North. I guess another thing that’s always made me a Yankee is NYC (even though screw the NY Yankees). I really identify with that city because of the people and the diversity, the architecture and the neighborhoods, just the vibe of the city in general.